Nikhil Arora and Alejandro Velez of Back to the Roots have done just that — twice. They perfected the art of mini mushroom farming, and then applied their technique to aquaponics. The idea originated after a presentation in their Berkeley seminar class. This inspired the boys to spend their senior year lugging large sacks of coffee grounds into the back room of Alejandro’s fraternity, where they experimented with different strands and farming techniques. Needless to say, not everyone believed in these boys and their crops from the beginning. After graduation, they turned down investment banking and consulting to pursue the field of fungus, and began selling at farmer’s markets in Oakland. 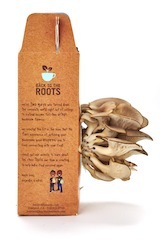 Their product was a hit, and at height of sales, they were distributing more than 500 pounds of mushrooms per week. Then, they came up with the kit, and soon after, their product found a shelf. After a few modifications, the Whole Foods in Berkeley accepted, and that carved the path for their current partnerships: Whole Foods, Nordstrom, Home Depot, and Fresh Market. To date, Arora and Velez have sold more than 300,000 mushroom kits. 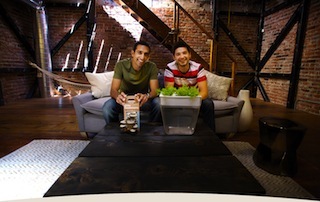 After locking down the mini mushroom market, Nikhil and Alejandro applied their sleek, simple design to aquaponics with the AquaFarm–a self-sustaining ecosystem where the plants feed the beta fish, and its waste feeds the plants. 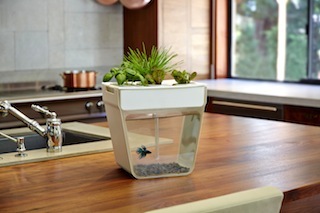 Nikhil describes how he was originally fearful of sharing the AquaFarm on Kickstarter, as others would replicate, but the comments provided by supporters fundamentally changed–improved–his product. Back to the Roots postponed the aquaponics launch from April to June in order to implement all of the Kickstarter critiques. It’s all about doing one thing, and doing it right. Today, Nikhil and Alejandro are selling in over 2,000 retailers nationwide. Though they’ve created a consumer product, Arora and Velez realize their success holds obligations to do good. Through a partnership with Revolution Foods of Oakland, with each AquaFarm sold, customers can vote online for an elementary school of their choice to receive a free serving of veggies. As far as the future, Alejandro and Nikhil plan to continue developing fun and inspiring ways for families to connect to their food, and to continue making change through business. Special thanks to Maya Horgan for helping research, write, and edit this story. All photography from Back to the Roots.